In less than one month, my husband Andy and I got married, went on our honeymoon, and moved from New Jersey to New York. It's safe to say we've been ready for a low key and relaxing summer. At the same time, we've wanted to make the most of the nice weather and explore our new city. Here are a few of the highlights so far. This year, our company marched in the NYC Pride Parade for the first time. Our group was small and we didn't have any crazy t-shirts or floats, but we had the best time. The music and people watching were fantastic, and the positive energy was very uplifting. I feel good working for a company that promotes diversity and hope to see our crowd bigger every year. On Saturday, we went to a BBQ at our friends' house in Jersey. We had lots of good food, beers, and laughs, some at the expense of this blow-up couch, which is probably the best money anyone has ever spent on Amazon. We got in some quality time with friends, dogs, and a baby that we are sure going to miss when they move towards the end of the summer. I made these Jell-O shots, which I've been waiting for an excuse to make ever since Pinterest became a thing. I liked that this recipe used coconut milk for the white layer instead of heavy cream or half and half, which doesn't seem like it would hold up well on a hot summer day. I used plain vodka for all three layers, but next time I might try using Malibu Rum for the white layer to make it extra coconut-y! We spent Monday doing tourist-y things. 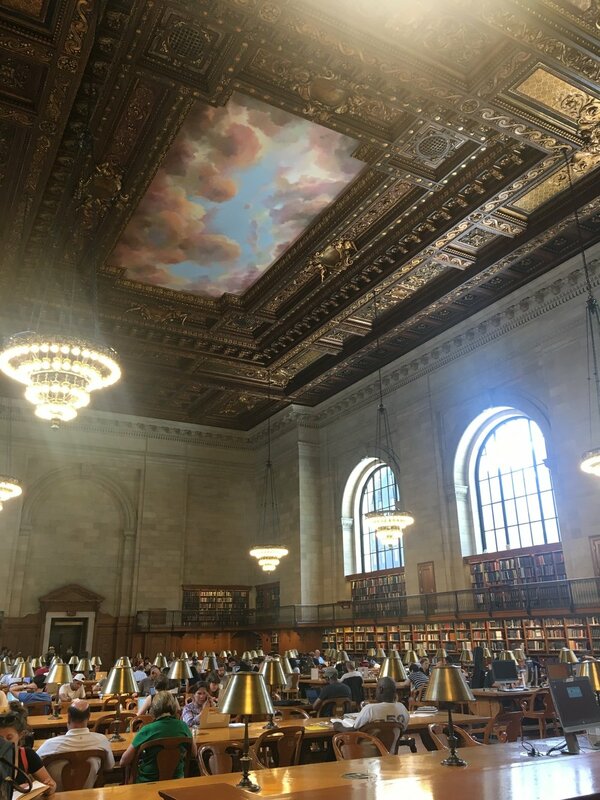 Over the weekend of the 4th, the New York Public Library on 5th Avenue was displaying its copy of the Declaration of Independence, handwritten by Thomas Jefferson. This is one of only two remaining drafts of the FULL original text, before Congress removed several passages, including one condemning the slave trade. We also explored some other parts of the library, including the Reading Room, which has always been under renovation when I've tried to see it. The whole library is beautiful. Afterwards we sat outside and had a drink in Bryant Park. Tuesday was spent strolling Central Park and having a few drinks with friends in the city. We decided we didn't have the energy to make it to the East Side for NYC's fireworks, but we did manage to catch a glimpse of the ones in Jersey from the roof of our building. This summer has included some pretty spectacular food experiences, including a few firsts. We tried a new sushi spot called Sushi Kaito that just opened up around the block. They serve sushi omakase-style, which means the chef chooses the dishes based on what's fresh, and prepares each course in front of you. The word omakase literally means "I'll leave it up to you." We were lucky enough to be the only two who had made a reservation during our time slot, so it was like we had our own private sushi lesson! One of my favorite parts of the meal was the wasabi that was grated fresh from the root. This meal officially spoiled me as far as sushi goes. This past weekend, we walked across the George Washington Bridge from the New Jersey side back to New York. It was a gorgeous day weather-wise, and the views were amazing. Have any of you ever biked across?! I gotta admit, it really freaks me out how narrow the bike/walk path is. I don't think I'll be trying it anytime soon. On Sunday we checked out the MET (Metropolitan Museum of Art) and discovered that they have a rooftop prosecco bar (!) during the summertime. As with most rooftop experiences, the prices were ridiculous, but worth trying once and enjoying the view of the city. Also, I am blown away by the sheer enormity of the MET. In the hour or so that we were there I feel like we managed to see only a tiny percentage of the museum. Other than that, we've been relaxing and decompressing from our recent big life events. I'll be posting a recap of some of that soon. I'm hoping the rest of this summer will include more adventures mixed in with plenty of park strolling, book reading, and glasses of rose on the rooftop.